I felt very excited and privileged to lead Riviera Travel’s very first solo tour for them. Being familiar with solo traveller tours, I knew that this departure would play a big part in Riviera’s history, because there has become a huge demand for it, as more and more people are travelling ‘alone’. Although, I like to ensure that on my tours nobody ever feels as though they are alone. I love leading solo traveller tours as they are extremely rewarding. These kind of tours can be so much more than a holiday to people, they are empowering and can enrich lives. Once people have taken the step of their first solo tour they have the confidence to plan another and they usually can’t wait to book the next one! With each guest travelling as an individual, everybody integrates easily – we all get to know one another so well and great friendships are formed. There are so many interesting stories to hear and also so many coincidences amongst everyone too. Two people from this group discovered that they went to the same primary school and were only one year apart! I arrived at the check in desk at Heathrow five hours before departure so that I was able to meet each member of the group before we flew. I found that this reassured everyone and it also gave me the chance to hand out my welcome letter and mobile phone number, alongside some initial instructions about our journey. When we grouped together at the boarding gate it was lovely to watch everyone chatting and getting to know each other already. Any initial nerves that some may have had, I could see were now beginning to fade. We were all excited to be escaping the cold January days at home and I was also very excited to be returning to Sri Lanka. This beautiful island is blessed with an exciting variety of opportunities for a holiday packed with adventure, relaxation, nature, architecture, culture and history. 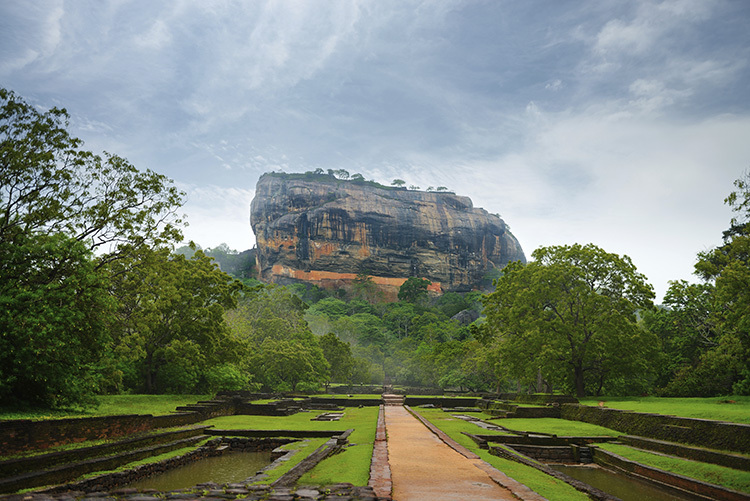 Sri Lanka boasts eight UNESCO World Heritage sites. These include ruins from ancient kingdoms; revered temples and forts such as the incredible Sigiriya Rock, a fortress from the 5th century. Many of us decided to try and climb the 1,202 steps to the top of Sigiriya Rock, where we were rewarded with magnificent 360 degree views. It wasn’t an easy climb, but we took it at a nice easy pace, stopping regularly to get our breath back, whilst the site guide, Neil, kept us entertained with stories of the ancient city of Sigiriya. Those who couldn’t make the climb all the way to the top had the option of coming part way up to see some 1600-year-old frescoes. Those who couldn’t make the climb at all visited the museum and gardens with our tour guide, Tikka. Another very enjoyable visit on the island was to Luckgrove Spice Garden in Matale, an area we passed through en route to Kandy. We were given an enthralling tour of the herbal medicinal trees and plants such as cocoa, cinnamon, sandalwood and aloe vera. Our host, Bonny, was extremely knowledgeable on herbal indigenous Ayurvedic medicine and he was such an entertainer. All of us were consuming lime juice daily after Bonny convinced us that it aids weight loss! After the tour of the garden was over and we had enjoyed a delicious cup of spiced cocoa and sampled complimentary massages with their magical ‘red oil remedy’, fresh bio natural cosmetics and Ayurvedic medicinal products were available to buy. In Kandy the group and I really loved our hotel, the Cinnamon Citadel. The lobby was open plan and overlooked the outdoor swimming pool and had a lovely view of the Mahaweli River. One of the other main reasons though that we really liked this hotel was the lavish array of delectable dishes on the buffet. The food in Sri Lanka was amazing, you can eat all the colours of the rainbow and sample every possible taste: sweet; sour; salty; citrus; spicy and always delicious! The Sri Lankan Curries were superb. There was usually a choice of fish, chicken and lamb, or just as tasty -in fact I would say even more so – are the vegetarian curries. My favourites being carrot, pea and cashew nut; aubergine; jack fruit; beetroot; banana flower and mango. My mouth waters just at the thought of these. The desserts were equally as delicious. There was always the classic buffalo milk curd and treacle on offer, but my favourite dessert was Pani pol coconut pancakes. There was also always an abundance of tropical fruits such as passion fruit, bread fruit, wood apple, guava, mango, papaya, watermelon and sour sop to name just a few! There were continental dishes available too and the restaurant staff were always happy to cater for all dietary requirements. My favourite way to start the day in Sri Lanka was with an ‘egg hopper’ and it wasn’t long before a few members of our group were also enjoying this for breakfast. The dish consists of a thin, round pancake with crispy edges made from rice flour and coconut milk, with a soft runny egg nestled in the middle. This can then be topped with another Sri Lankan favourite – coconut sambol and tempered onions – washed down with a nice cup of Ceylon tea, served black with a small sweet block of jaggery (palm sap) on the side. In every restaurant throughout the tour we had tables reserved for our group, so that we could all be together over dinner, chatting about our day and getting to know one another better. Although the evening usually began a little earlier, when we would all meet for pre-dinner drinks in the hotel bar. 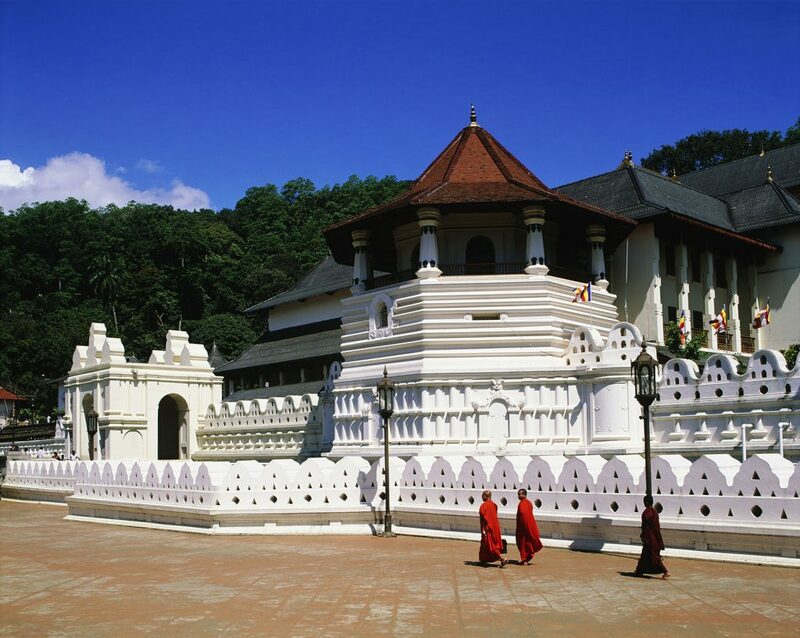 In Kandy we did a sightseeing tour in the morning, visiting the famous Temple of the Sacred Tooth Relic and the beautiful Royal Botanical Gardens. There was free time in the afternoon for guests to either relax around the pool or explore the town of Kandy at their leisure. From Kandy we headed higher into the lush green hills which were dotted with tea plantations and tea estates. The rich combination of the land, sun and rain on the island presents the ideal climatic conditions for the cultivation of tea. Ceylon tea has a distinct taste, quality and character, you can’t come to Sri Lanka without taking at least one packet home with you. It was raining in the hills the day that we visited and the Tea Pluckers were taking a break and sheltering themselves from the rain. However, the sight of our tour bus encouraged them to leap into action, so that us tourists could take some nice tea plucking photos in exchange for a small reward! The scenery is endlessly spectacular from all corners of the island and is so far unspoilt. Long may that continue to be so with the help of the many Eco-Tourism organisations and Eco-Resorts there are, dotted all over the island. The clear blue Indian Ocean laps up against the shore of pristine golden sandy beaches, national parks have an abundant movement of wildlife, and in places like Yala, the two come together with wild elephants sometimes seen at the beach and wild boar roaming around the hotel swimming pool! On our safari we saw an elephant, crocodiles, mongoose, land monitors, spotted deer, sambar deer, buffaloes and plenty of bird life. There was also the chance to see the elusive wild leopard and some lucky members of our group saw one in the distance! We visited the amazing Elephant Transit Home in Udawalawe National Park. It was so refreshing to visit a genuine elephant orphanage. Not a single chain or hook stick in sight and certainly no elephant rides, bathing or tricks. We quietly watched, from a distance, the elephants have their feed. They were very playful and looked happy and healthy. Some of the bigger ones were gathering around the little ones for protection, just as the mothers would do in the wild. Udawalawe Elephant Transit Home is run by the Department of Wildlife Conservation. They rescue orphan elephants and return them to the wild when they are ready, providing a humane alternative to taking abandoned animals into permanent captivity. Visiting Udawalawe was definitely a highlight of the tour and such a pleasant and happy experience. My absolute favourite place in Sri Lanka is Galle and I was so happy to hear members of the group sharing this opinion. It’s an exotic coastal town on the south of the island. As you wander the streets around Galle Fort you can admire the attractive Dutch colonial influenced architecture and as venture deeper inside you find yourself in a treasure trove of chic boutique shops, stylish boutique hotels and courtyards where you can take refuge from the sun and enjoy a refreshment or a bite to eat. The Fort itself is one of Sri Lanka’s eight UNESCO World Heritage Sites. It was built by the Dutch in 1663 and is set on a promontory with a backdrop of the Indian Ocean. It’s a happening little town with a real buzz in the salty sea air. An orientation tour on arrival set the group up ready for their chance to explore at leisure during their free time at the end of the tour and by this stage everybody had become good friends, so most headed into town in small groups in convoys of Tuk Tuks! Galle was a grand finale to a wonderful and very memorable tour. There were some emotional farewells on our last day, but also so much joy as we reflected on the wonderful experiences we had all shared together. Everybody in the group shared their contact details with one another to keep in touch and share photographs, and there was talk of a group reunion – possibly on another tour! This was a very auspicious group both for myself and Riviera Travel and I look forward to the day that I get to meet each of them again. I’m also very eager to welcome many more solo travellers on new adventures around the world. Great to hear that you’re doing Solo hoildays. I’ve loved my holidays with you: excellent value, , great organisation and friendly staff. I’ll be signing up soon!! It was a wonderful tour which has convinced me to travel solo from now on! Many thanks to Riviera – and to Caroline in particular- for making it so memorable. So excited to read all about the tour, I am also booked in for my first Solo trip to Sri Lanka in October and I am really looking forward to it and this has really made if even more special, feel terrible wishing the year away but I can’t wait!! Thanks for your comment. We’re pleased to hear you’re looking forward to your tour with us in October, we are very excited to welcome you and we hope you have a great time. An Excellent Holiday to a Beautiful Island. It is hard to believe that 22million people live here. So much beautiful scenery & history the Sri Lankan people are so friendly. Wherever we went the hospitality was first class. I would once again like to thank our Tour Manager Caroline, along with Tour Guide Tikka for such a memorable holiday. The whole group got on very well, many new friends made. I look forward to another Riviera Solo Tour in the near future. Thank you for your comment. We are extremely happy with the great success of this tour and the positive feedback we have received. We are most pleased that you all had a great time, and your kind words have been passed to Caroline. Sri Lanka truly is a magical place and we are glad you enjoyed yourself. We look forward to welcoming you on to another of our solo tours in the future. Lovely to read about the first solo trip. I’m booked on one later in the year. I love Riviera and am so pleased that they’ve decided to do solo holidays. I hope they’re a great success. Really looking forward to my turn to be a part of this. Thank you very much. We are so pleased that you are looking forward to your forthcoming solo tour with our company. We hope that you have a fantastic time!